PLEASE SHARE THIS VIDEO far and wide and use it as a tool in our collective efforts to turn the tide on fracking in Boulder County and beyond. Learn more below and discover how you can join your friends and neighbors in protecting the health and safety of Boulder County and communities across Colorado from the threat of fracking. Crestone has applied to drill across 7,680 acres of Open Space and private property near homes, schools, and neighborhoods on massive industrial well pads. The O&G industry has been fracking our Colorado communities and trampling our fundamental rights for almost a decade. Boulder County citizens are standing up to protect our public health and safety, our home value, and prevent the Open Space from becoming an industrial zone. Hold Our Ground was created in November 2016 by Boulder County citizens who are willing to fight for our fundamental right to say "NO!" when it threatens our health, our home, and our children's right to a livable climate. Our mission: Inspire a grassroots movement of thousands of friends and neighbors who together stand up and block the drilling permits. 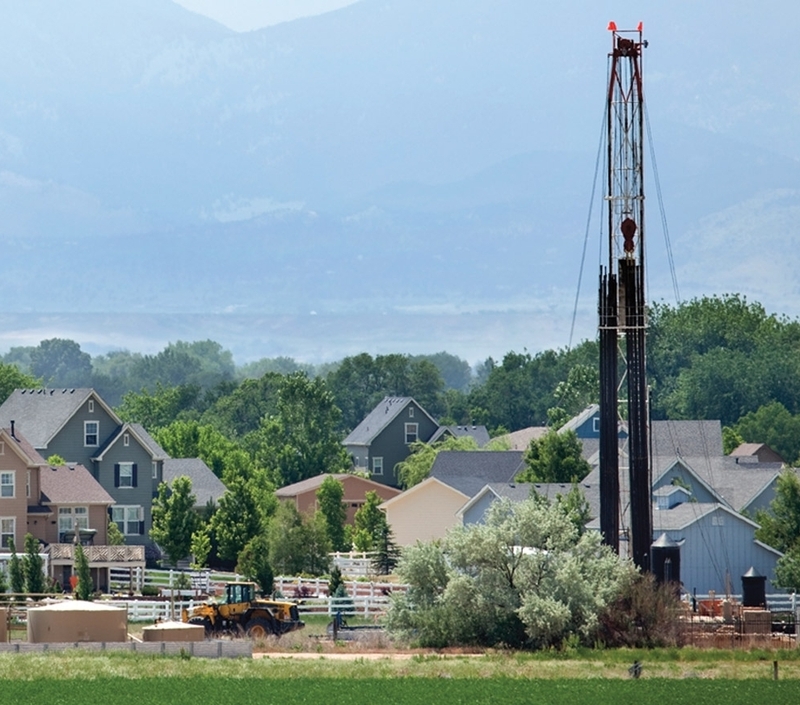 Currently drilling applications are under review by the state regulatory agency, COGCC, to be issued in 2018. Learn more about our citizen-led legal case against fracking to protect Boulder County citizens and the environment. Help us hold our ground. Contribute to our legal defense or participate by writing emails and hosting meetings. Learn more about the Crestone Peak Resources CDP and the 8 North Extraction drilling plan. 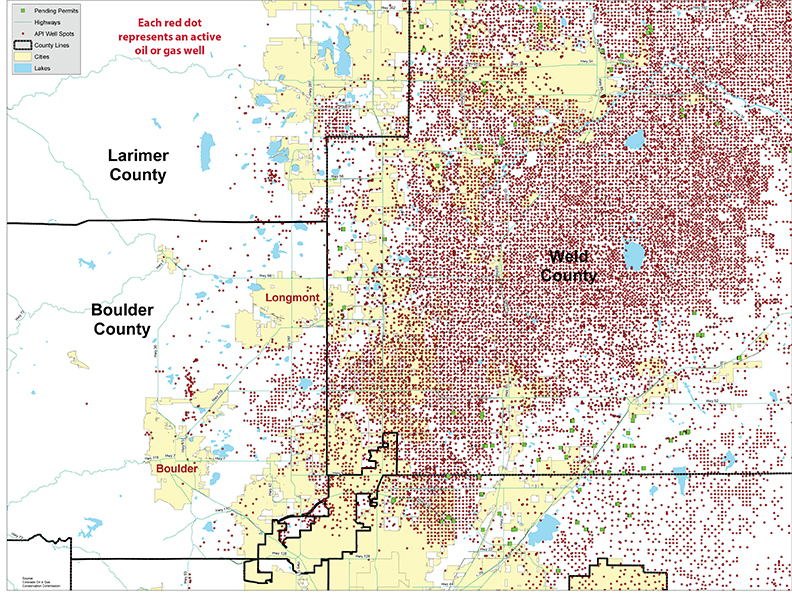 Weld “Well” County has 50,000 wells. In the map (below) each red dot represents an oil and gas well. Once the door is opened to fracking in Boulder County, it won’t be shut again. Drilling will move west across Boulder County and our land will be permanently changed. Download a PDF of the Weld County Well map. 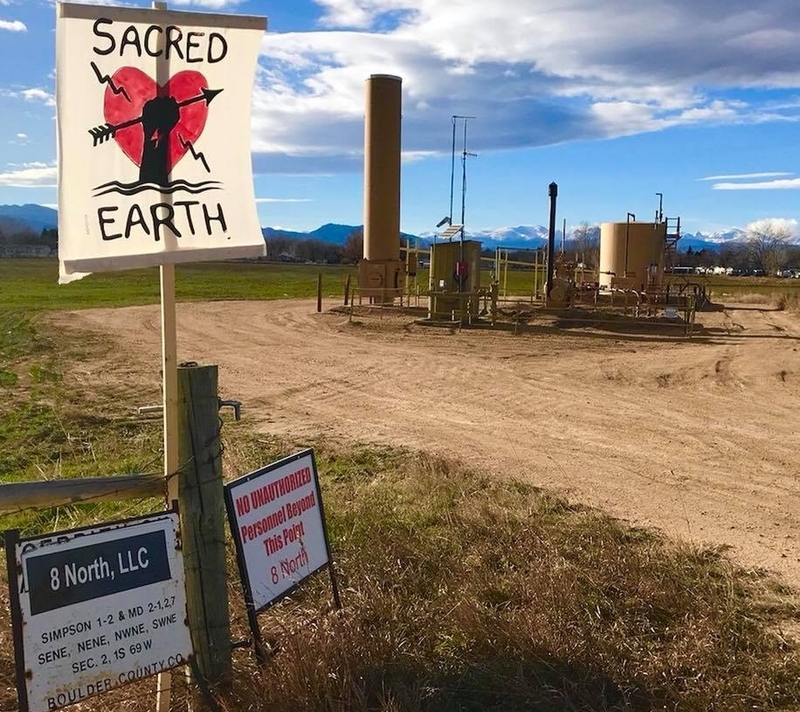 The two oil and gas operators targeting our Open Space, 8 North Extraction and Crestone, have a troubled history along the Front Range. These operators are complaint ridden and have been in ongoing violation over unsafe drilling practices. In April 2017, a house exploded in Firestone killing two people as a result of a methane leak. On Dec. 22, 2017 in Windsor, CO an O&G worker was severely injured from an out-of-control explosion. Since last year, residents from Erie, CO filed more than 500 complaints. Citizen complaints are climbing daily, with residents protesting nerve-shattering drilling 24/7, ongoing noise and rode traffic accidents from heavy truck traffic, and toxic fumes from cancer-causing emissions. We did it. Citizens across Colorado collected over 172,000 ballot signatures (99,000 was all that was needed) to get the 2,500 ft. safety setback from any new drilling and fracking on the November 2018 Colorado ballot. Contact us at unite@corising.org to get involved and visit our Events Calendar to find local events where you can plug in. Thank you!